Cubes and cards are two words that are normally used when it comes to storage of cards in cubes. Not this past Sunday, I for the first time in person got use Cubes and cards in a whole different meaning. The format of magic the gathering is a bit more challenging and the cards can be and in most cases are very expensive and rare to even own. What is a Cube Draft? 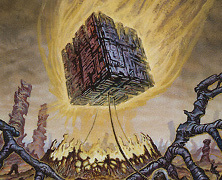 A Cube Draft is a booster draft variant in which the pool of cards is a predetermined set of cards chosen for the purpose of drafting them. The pool of cards is known as a Cube and usually contains a minimum of 360 cards to accommodate an eight-player booster draft. Last Sunday, I attended my first cube draft. It was a small one of six people. The house was in the west end so it wasn’t that bad a commute. I mean I’m used to travels of half an hour for a good play scene. The house that was hosting the event was nice and somewhat clean. The people that I played with were nice and all. They asked if I had any idea on how to cube. I said yes and I only have played online cube drafts with myself. With cubes, the card pool is very expensive. This one didn’t disappoint. I won’t dwell on all the different cards but I can say that I finally got to play with scrublands and badlands. Each of those are about $60 a piece. A highlight of the draft and games were how I won a game the other person using all their cards to kill themselves. The difference from regular drafts is that you are using cards not normally put together for this format. At the end of the day, I had a great time playing something I only played online. I got invited back out for the next time and this time, I’ll win more than one game.